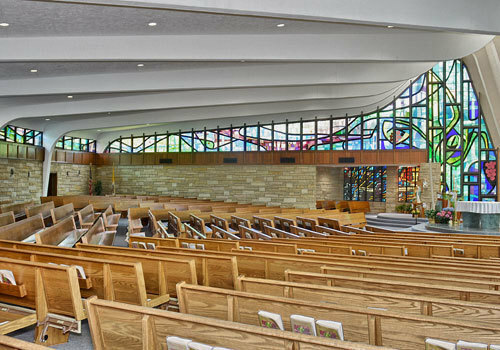 A design study of the windows in our church assists our parishioners and visitors in learning the love, promise, glory, and truth in Our Lord, Our God. Beginning at the right side of the church, as you face the altar, you&apos;ll find a color realm of deep blues, blues, and purples. These are colors that help our mind to reflect upon the skies and the heavens, and the majesty of our Lord. The Tree of Jesse symbol, entwining itself through the color and line and with almost a vine- or tree-like nature, describes the genealogy of Our Lord. The root takes ground in Heaven, near the top a lily-like form tells us of Mary, Mother of Jesus. Topping and almost rising through the lily is a Chi Rho, symbolic of Christ. Limbs or vines extend away, depicting the Messianic promise to Issac — logs and fire, a symbol of his sacrificial willingness to obey and his unrelenting faith. The crown — symbol of David, the King — reflects the loving and forgiving Son. The sun, a symbol of Jacob, foretells the coming of Christ and the new light. The sacrificial knife and flame is a symbol of Abraham, who was willing to sacrifice his son at God&apos;s request and the grace that was bestowed upon him for his love and faith. Abraham is the father of all true believers in God&apos;s revelation. From this linear motion and color flows forth bright colors, happy colors, and gray for sorrow and hurt. Reds and purples express war, famine, and sufferings. Grays of various tones and blends reflect man&apos;s weakness and temptations. Greens: the fruits and benefits He makes. Golds and ambers are colors suggestive of God&apos;s offerings and goodness. These colors blend completely around the nave, the central area of our worship space, and repeat in different patterns the generations of the past, present and future until they meet at the second symbol of our message, the Tree of Life, the Chi Rho, which reaches out to the people and, through its grace in communion and sacraments of Our Lord, gives us the fruits upon which we nourish and can prepare ourselves for Heaven. A wheat and grape symbol is entwined into this overall picture to again tell us of God&apos;s Gift — His only Son, Jesus Christ, Our Redeemer. The last portion of the window design is reflected at the Blessed Sacrament Shrine. This, through symbols, again tells us the story of the Resurrection. The chalice and host, depicting our Lord, and wavy lines rising from a dark gray area, symbolic of the tomb, remind us of His Resurrection and Ascension. Throughout, colors and lines alone depict humankind and its natures. Since man and woman of all centuries would be impossible to describe pictorially, it has been executed in colors and lines to bring out feeling and expression. As such, it has been chosen to express this by the colors which best describe humankind&apos;s actions and emotions. Other windows are kept in the basic theme and are simple color and linear effect to bring forth a unity of expression. The one window which depicts our Lord as a man is the window that expresses His desire for us to come forth to Him in a welcoming gesture. [Located at the entrance to our church], this is to allow anyone entering our church the spiritual welcome of our faith. Commissioned by Pastor Monsignor Michael Donovan and completed in 1993, our sanctuary mosaic is rich in scriptural and traditional Christian symbolism. Its centerpiece is a monogram of the Greek letters X (Chi) and P (Rho). These are the first two letters of the Greek word for Christ, Xpistos. The Chi-Rho symbol was often used by Christians of the early Church to identify each other and to symbolize their common faith in Jesus the Christ. In Christian art, the four creatures have been used to symbolize the four evangelists: Matthew the Evangelist symbolized as a winged man or angel, Mark the Evangelist symbolized by a winged lion, Luke the Evangelist symbolized as a winged bull or ox, and John the Evangelist symbolized by an eagle. A refurbished pulpit and lectern, new candlesticks, cross, re-plated tabernacle, and Baptismal font cover were part of the overall improvements to the church made when this mosaic was installed. The Risen Christ statue was re-located on the main wall of the sanctuary above the mosaic. Commissioned by Monsignor David Funk, pastor of St. Pius X from 2007-2018, our Pope Saint Pius X mosaic was installed in the church near the Blessed Sacrament chapel on February 12, 2016, and was blessed by Monsignor at Mass on February 13, 2016, "to the greater honor and glory of God." The commissioned work of art featuring the parish&apos;s patron saint was created in Italy over several months and incorporates some remaining background tile from the sanctuary mosaic, installed in 1993, to unite the two pieces. After visiting Venice and Pius&apos;s home in nearby Riese, Italy, in 2014 with 44 travelers, many of whom were St. Pius X parishioners, Monsignor Funk wished to commemorate the Pope&apos;s anniversaries and the pilgrimage. He commissioned the mosaic from Italian artists, deciding upon this medium to complement the existing sanctuary mosaic behind the altar. The art is custom-framed in 100-year-old oak by James Funk, brother of Monsignor. James is a master craftsman and creates beautiful, one-of-a-kind wood pieces, including frames, side tables, and coffee tables.